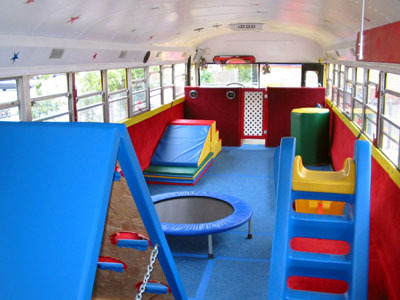 The Tumble Bee is a full-sized school bus converted into a safe and fun gymnasium. We operate in the greater Austin area. 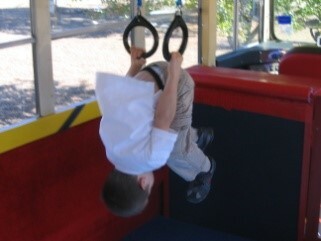 Our mobile mini-gym is air conditioned, fully padded and filled with state of the art equipment specifically designed for student’s ages 2-10 years old. The Tumble Bee has bars, beam, vault, ropes, rings, trampoline, a climber mountain, and much more! And most importantly – HAVE FUN!! 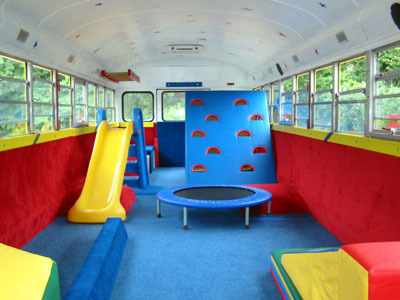 A fun and safe environment for children to learn and grow. Quality Instruction from certified instructors. Weekly classes with set lesson plans at your child’s daycare. Birthday parties for one hour on The Tumble Bee! A way for you to give your child the gift of fitness while freeing up your valuable time. We come to the kids and do all the work for you!